Two foot surf has lost its luster. The traffic has gotten out of control. June gloom has spread itself too far into the later summer months. I was enjoying summer so much in the beginning, and now I straight up despise it, as I do every year at this time. I can’t wait for fall. No. I can’t wait for winter. I can’t wait to slip on a wet full suit on a chilly morning when Swami’s is double overhead. I can’t wait for a biting cold session at rainy Rincon. I can’t wait to run across frigid pavement on my way to the waves. I can’t wait to get my first ice cream headache of the season. What’s strange is I say the same thing every year. And then, come mid-February, I’m at it again, wishing the wind would calm down, the water would warm up and the tourists would descend on my coveted spots. They say we only have two seasons in Southern California, summer and not summer. At least we live in a place where we can get excited about both, without having to endure the pipes freezing over in winter or cranking the AC all summer. All months here have their merits. Fall is always fun. December and January pump. 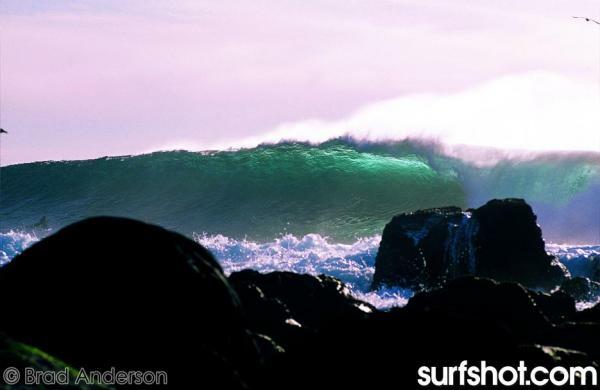 Spring produced one of the most memorable south swells in a lifetime this year. And here we are at the end of summer. Basking in all the things we love it for: warm water, long days, a string of southern hemis. Sounds perfect… but I’m ready for something more. I’m ready for… I can’t wait for winter. This entry was posted in Magazine, Photo Exposure at Isla de Todos Santos. Bookmark the permalink.